My kitchen is small. It’s a gallery kitchen with very little counter space, so I am always optimizing it for extra storage. 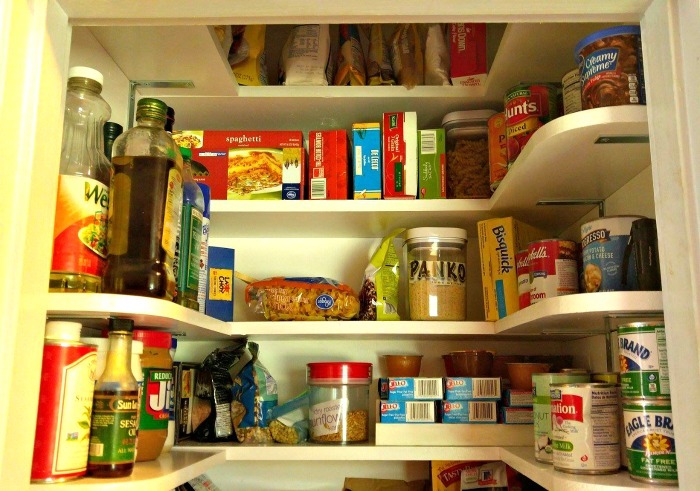 The pantry is the size of a small closet and every single thing in it plays hide and go seek with me when I try to cook. 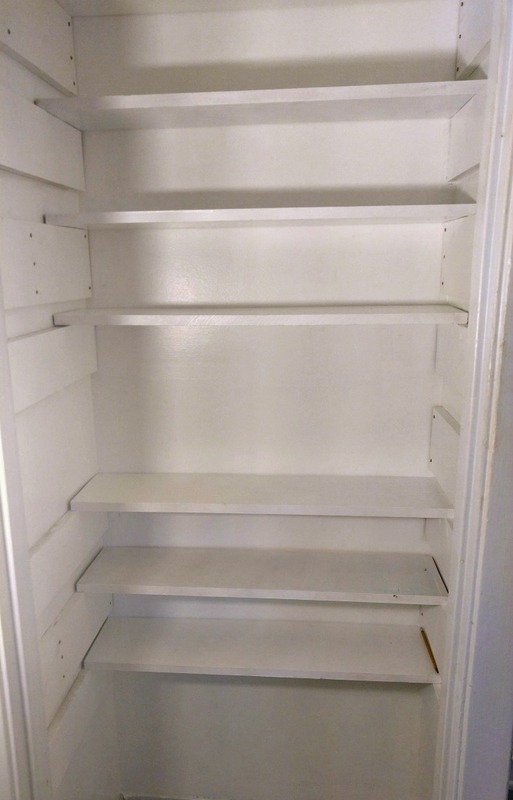 I have had enough of this baloney and decided that it was time for a pantry closet makeover! The pantry had some shelving in it. 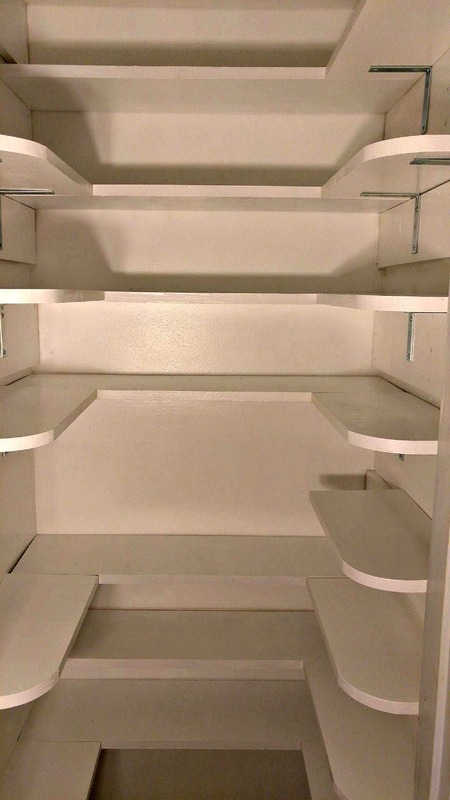 The problem has always been that the shelves come right to the door of the closet. That means that even though I have some organizational plan in there, there are always things that just get shoved to the back. When I am making recipes, I look for them, can’t find them and add them to my shopping list. And it goes on and on. Can you imaging trying to find anything in here? Fortunately we have a huge dining room table, which gave me a place to store everything while we were working on the pantry closet makeover. Now bear in mind that this dining room table has enough room around it for 10 full sized dining room chairs. If I were a betting woman, I would never have wagered that ALL OF THIS STUFF was sitting in my small pantry. I’m still stunned about it weeks into the makeover. Not only that, but there was also stuff on the floor as well! My mind can simply not comprehend how one tiny pantry can hold all this STUFF. Whoops…got side tracked there for a minute. 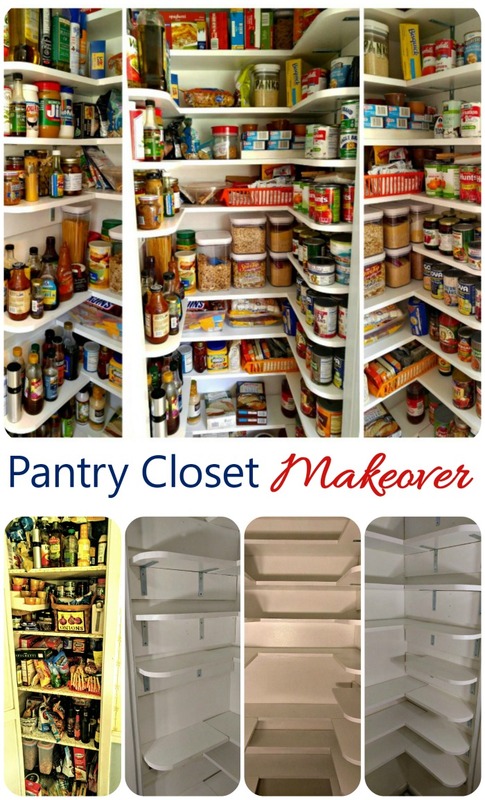 Back to my plan for my pantry closet makeover. In spite of the small doorway opening, (23 inches wide at the doorway and about 30 inches on the interior wall spacing) I knew that I wanted the pantry to be a “walk in.” My sweet husband measured the opening after we decided what size to make the shelves. I said “See, I’ll fit! !” He said “yes, there you will” (looking at my shoulders), and then looked at my hips and grinned. Good thing he is a handyman, and will be doing most of the work on this little project or he would not be getting any baked goods for a while!! 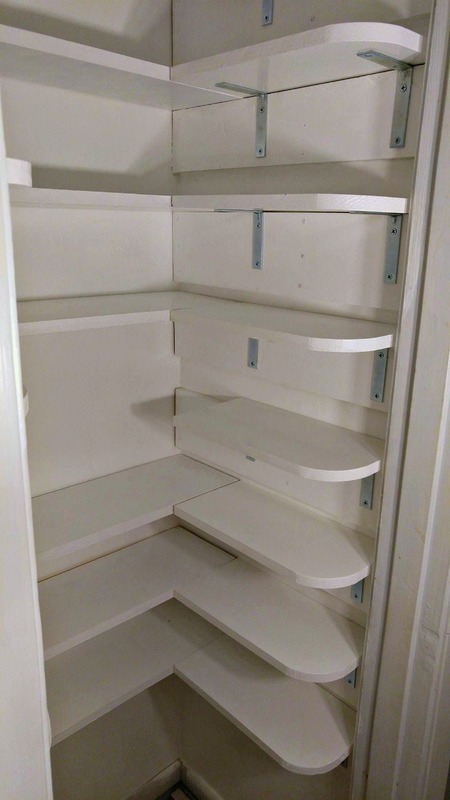 The first step for my pantry closet makeover was to remove half of the shelving on the existing shelf set up. Each shelf was made of two pieces, so we had enough wood for the whole back wall, even with extra shelves. We decided that we would keep that placement (23 inches apart) and then add more shelf braces between the existing shelves to give me room for the cut out area where I am determined my hips WILL fit. 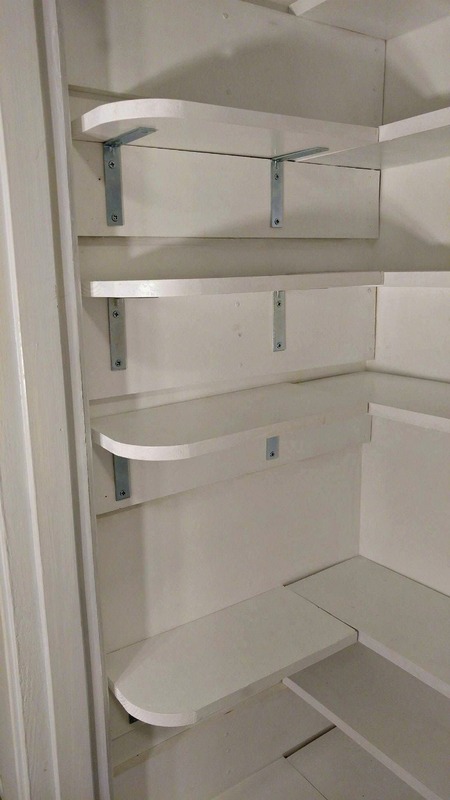 We had to do the back shelves first, since we were using side braces to hold the back shelves and there is no way to get them in once those extra side braces were attached to the pantry wall. Some of the back shelves will stay spaced widely as they were before and others have extra shelves between them. I wanted to absolutely maximize the inner space, since I knew that ALL THAT STUFF had to find a way to fit back in there, along with my ample hips. To round the corners of the entry shelves, Richard used a metal mixing bowl with the right curve on it and cut the corner off with a Skilsaw, and then sanded it with sandpaper. A fresh coat of white paint got added to all the shelves and we were ready to get started on the pantry closet makeover. Since I had a combination of normal canned good sized items and taller bottles and oils, I decided to have one whole side have and extra shelf to hold the smaller sized cans. Those shelves go all the way up the right side of the pantry and are spaced evenly between the existing shelves. 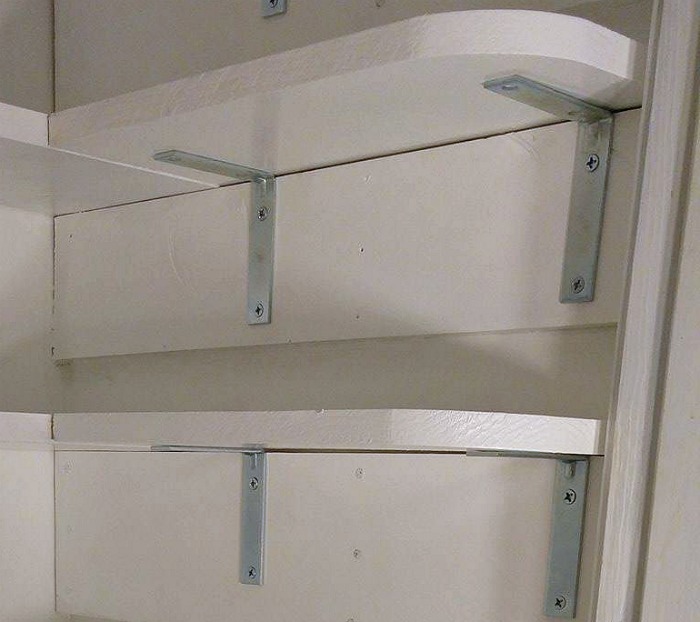 All of the side shelves are held in place with L shaped brackets which are screwed into the side braces. The left side of the pantry would be a combination of existing spacing as well as some with the extra shelf. We also went higher in the closet and lower than it is now. 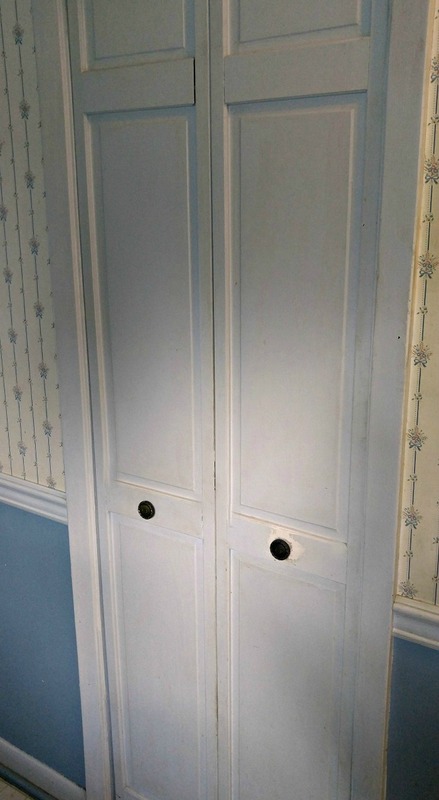 The last part of the pantry closet makeover was that we would remove a concertina style door that opened into the kitchen and replace it with a sliding bar door style. At this point I was getting excited and saw my whole kitchen getting a redo and started stripping wallpaper off the walls to “help out.” My husband was not a happy camper when he came home and saw this but that’s what he gets for his hip grinning moment. A quick paint of the skirting board, and removal of the old trim, and the finished interior is completed! Time to see of all of my supplies will fit back into the finished pantry. I have been cooking up a storm this week, trying to use up some of the excess supplies. After all, who really needs 7 boxes of Penne pasta, I ask you? We haven’t bought groceries in two weeks while this has been going on! I already knew that I was only going to put back in what I want to have in there. I had some 20 year old dried beans that ended up in the trash and some of the overkill on excess went into packing boxes for a while, but, even still, most of it fit back in. 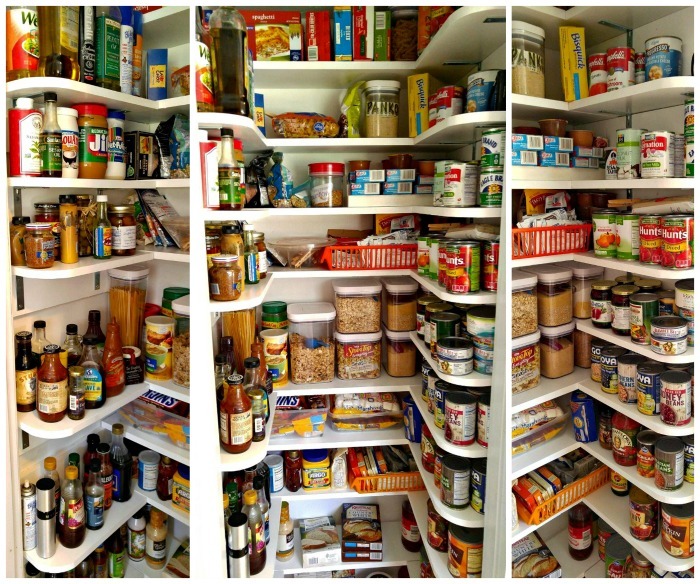 the photo below shows the entire pantry in the middle and closeups of the two side walls. I am delighted with the way it came out! And even though there is not QUITE as much space, I CAN SEE IT ALL NOW!!! I’ll gladly give up a bit of space to be able to see what I have on hand. I just love the way things are spaced out. The shelves are the perfect height for my different Oxo Pop containers and I am a happy camper. OH…and by the way…MY HIPS FIT PERFECTLY, thank you very much! These were the supplies that we needed to complete the project. The barn door will come together later so we didn’t buy those supplies yet. Primed white trim board in a 7 1/4 inch width was inexpensive and the perfect size for the side shelves. The existing selves were removed and trimmed with a circular saw to a width of 8 inches. These will go on the back wall of the pantry. A blade for a Skilsaw to round the corners of the edges near the opening so I don’t hurt myself when I enter the pantry. The next step is to do the barn board sliding door to replace this concertina door. Stay tuned for this project! What kind of set up do you have in a small kitchen to hold all your supplies? I’d love to hear about it in the comments below! Once we got the pantry finished, it needed a new door. 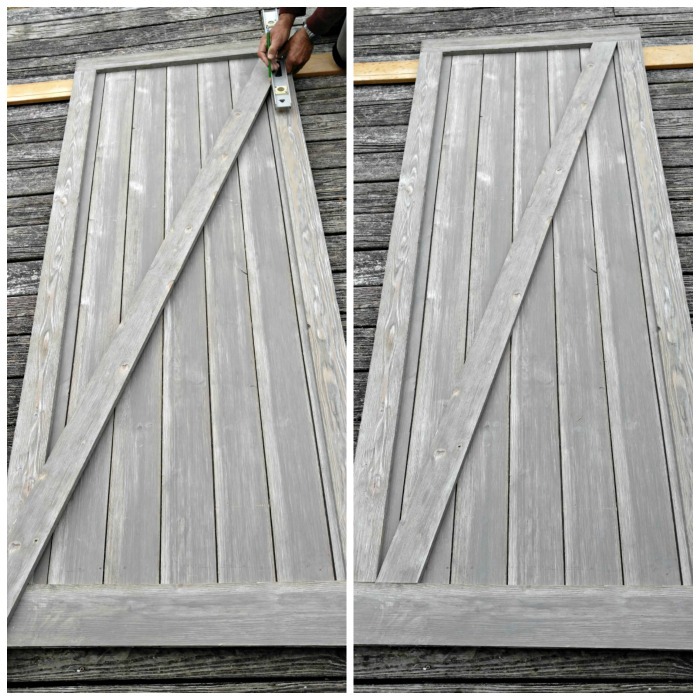 See my project for a shiplap barn door here. This post is perfect! 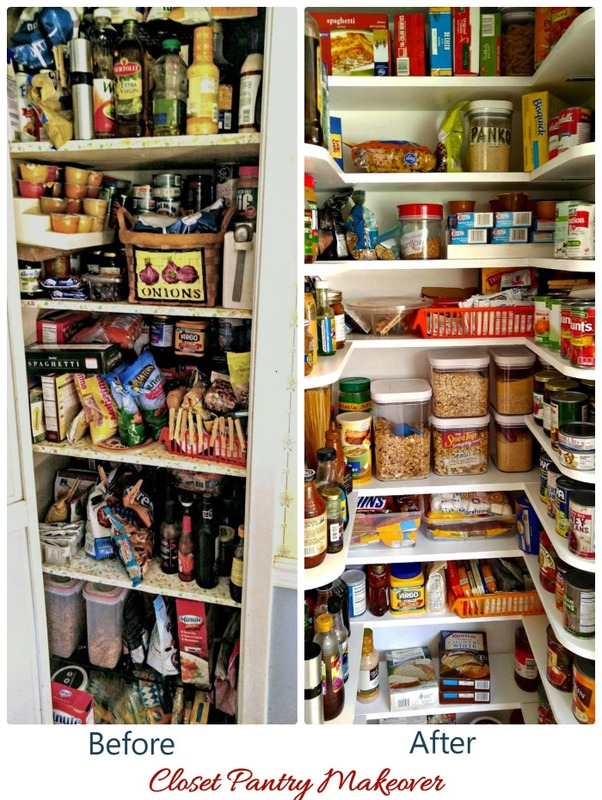 The pantry in my house we bought last year has this exact same layout and I have been struggling trying to figure out what to do with it to make it functional. 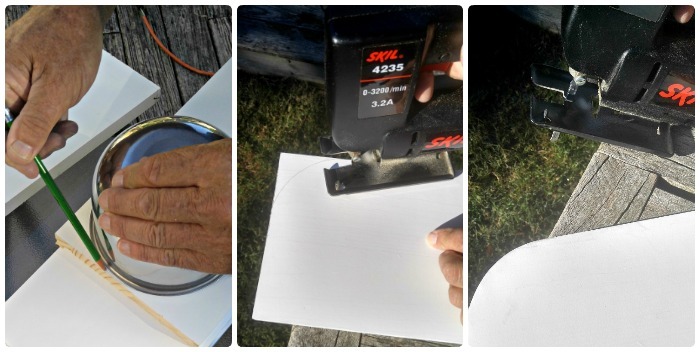 You’ve provided a beautiful solution and my husband has the tools and know-how to do it! Thank you so much! Just lovely! Be thankful that I live far, far away or I’d be hanging out at your place trying, unsuccessfully knowing R as I do, to steal him away from you. What a great joy you both did. I am truly impressed. I just love it! It makes me smile every time I walk by it. That “joy” was supposed to be “job” btw. Ugh! Carol, this was perfect timing! I found this just as I was converting coat closet into a pantry very similar to your “before.” You saved me from later disappointment! But could you please do me a favor and tell me the length and width of the back shelves and the side shelves? It’s difficult to tell. Oh, I hope you see this, two years later. Thank you!! HI Amy. Sorry it has taken me so long to reply. The hurricane hit NC at the end of our vacation which has made for a delay in getting back to work. The back shelves are 29″ long and 8 1/4 inch wide. The side shelves are 14 inches long x 7 1/4 inches wide and rounded at the entry end. Your sizes will depend on the width of your closet interior.